The HP LaserJet P2035 Laser Printer is a top performer that produces high-quality black-and-white documents and graphics at an affordable price. Speeds of up to 30 pages per minute and both USB and parallel ports make this printer fast, convenient and easy to use. This printer's first page prints in less than 8 seconds and operates quietly with available quiet mode. Manual two sided printing helps to cut paper consumption and thus save money. 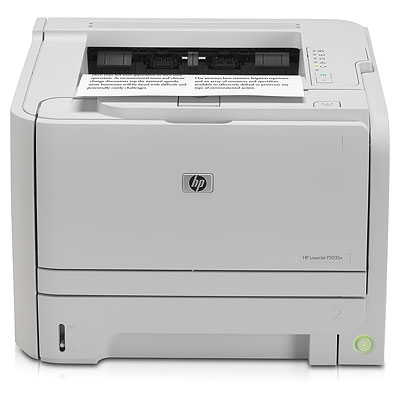 Instant-on Technology helps make the LaserJet P2035 more environmentally responsible. Instant-on Technology in HP LaserJet devices provides up to 50 percent energy savings over traditional fusing while providing a first-page-out in seconds. Quickly and accurately process complex print jobs without the cost of buying additional memory using the host-based print driver, a 266 MHz processor, and 16 MB of memory.